That’s an MST3K reference there, in case you wondered. And I use it because my kid has taken picky eating to the level of an extreme sport. Chloe is naturally a fairly high-anxiety, control-enthusiast type personality (wonder where she gets that? 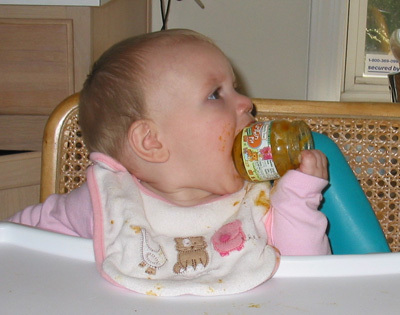 ), and when she was 2, she got a dreadful stomach virus that caused continual vomiting for days. It was bad enough that I actually stopped nursing her for 24 hours, because her stomach seemed unable to digest anything. We wound up giving her 10mL of water a few times an hour to keep her hydrated, and had to give her Phenergan suppositories to even let her keep that down. It was horrible and traumatic. And ever since then she’s had almost a phobia of any new food, and tends to stick with bland, uniformly-textured, familiar foods. She would quite happily eat nothing but refined baked goods and dairy products if I let her. Let me tell you, I’ve grown to hate advice about picky eaters. Making food into fun shapes, smiley faces, or forests of broccoli standing up in mashed potatoes is totally ineffectual. Might work on amateur picky eaters, but not on my champ. I bought The Sneaky Chef in hopes of getting some nutrition into her, but so many of the recipes are about sneaking vegetables into things like meatloaf, spaghetti sauce, and macaroni and cheese, none of which my kid will eat in the first place. The other problem is she may be a supertaster. Despite Missy Chase Lapine’s assurances that all her recipe shenanigans were undetectable to test audiences of real children, Chloe immediately called out my attempt to include a smidgeon of orange puree in a cheddar quesadilla. My best friend says the truly epic level of Chloe’s sensitivity to flavors came home to her when she made macaroni sprinkled with cheddar cheese for her kids, and saved out a bowl of plain macaroni for my kid. Much like a gustatory Princess and the Pea, Chloe politely declined the pasta, saying it tasted funny, and my friend found one lonely shred of cheese at the bottom of the bowl. Here is what has worked (however slowly and gradually): her pediatrician talked to her about nutrition, and asked her to agree to two rules. She won’t have second helpings of starch – one serving only. And she needs to try a bite of one unfavored food at dinner each day. Chloe agreed, and she seems to take her personal integrity much more seriously than a sticker chart. When she’s reluctant to try a bite of something, I remind her that she won’t feel very good when she goes for her checkup and has to tell the doctor she didn’t stick to their agreement. She still doesn’t like trying new foods, but she’s becoming much more inured to it. Each time she survives having a bad taste or weird texture in her mouth, it helps her move away from her dread. It’s very slow going. Last week she opined that if Italian sausage was the last food on Earth, she would probably eat it, and her dad and I did a celebratory dance once we were out of her sight line. The important thing to us is there’s progress, even if it’s extremely gradual. The other thing that has helped is giving her control. I taught her how to make scrambled eggs (using the only correct method – Alton Brown’s). No kid can resist the allure of being allowed to crack eggs. She will now make eggs for the whole family, all by herself, and she will eat them. For a child whose sole sources of protein were peanut butter and cheese, that is HUGE. I’m letting her help plan meals and cook more and more, and the kids are also helping us plant and tend a garden. Perhaps a zucchini or blackberry that she observed forming from a flower, and which she tended herself will be less scary than an anonymous vegetable plunked on her plate. Next week, I’ll post my review of The No-Cry Picky Eater Solution, as well as a couple other tips that have helped us get our kids eating better.